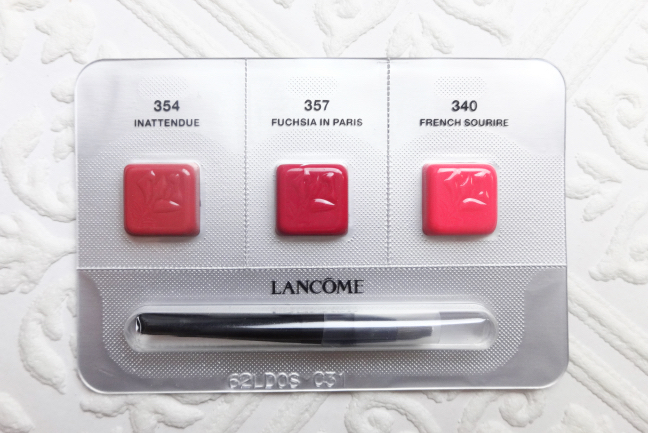 I can't really fault Lancôme or the sample itself. It includes a great selection of colors that would appeal to many people. It even comes with a small lip brush if that counts at all. The colors - they are pretty, vibrant, and wearable. The formula - it feels moderately hydrating and weightless on the lips. The packaging - the tube looks simple, sleek, and functional. The scent - it is scented with the same fragrance as the Lip Lover range, which I'm not so crazy about. Some people do like it, and it isn't a strong scent, though. The hydration claim - it is there, but not for 8 hours. I mean, it has to stay on for longer than a few hours for us to talk about 8 hour something, no? The finish is pretty but I don't love it. It gives a subtle kind of "shine" that is similar to many other sheer lipsticks like Dior Addict, Chanel Rouge Coco Shine, and NARS Sheer Lipstick. Now, on to the swatches. Inattendue is a soft peachy pink. There is nothing "unexpected" about it although it pulls a bit pinker on my lips. Fuchsia In Paris is a very pretty fuchsia with deeper undertones which makes the color easily wearable. 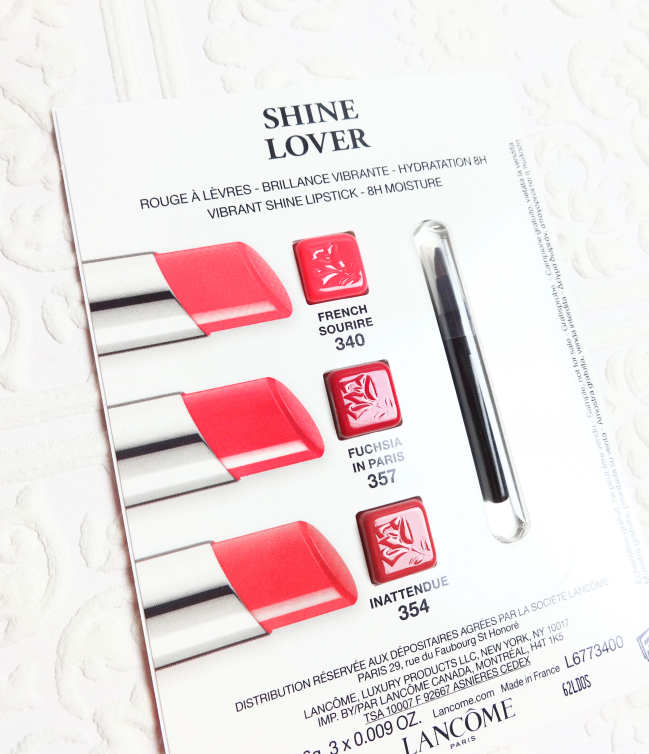 Unfortunately, I already have too many of similar shades and a few even come in better formulas than Shine Lover's. You can see this color in context here. 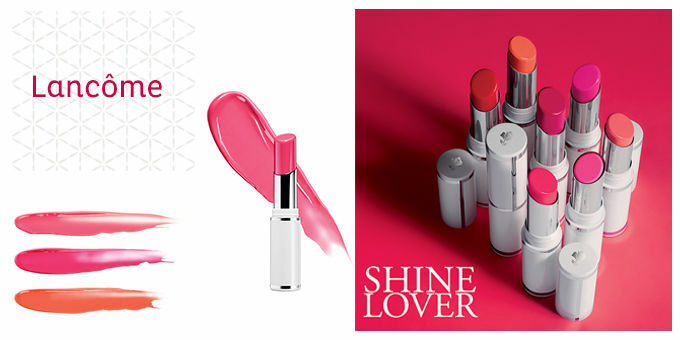 French Sourire is the star shade of the range. It is a vibrant medium pink with a nice dose of warmth. I might want this in the future. I find the range has quite a few interesting shades, especially the pinks. The $25 price tag is certainly modest especially when a NARS Sheer Lipstick is now pushing $30. Have you tried these? What are your thoughts on them? I agree although I wished the brush had been more useful. Still it is a nice touch! Wow they are so much more expensive here! I have one and it's ok. I agree the pinks are the way to go. Oh? 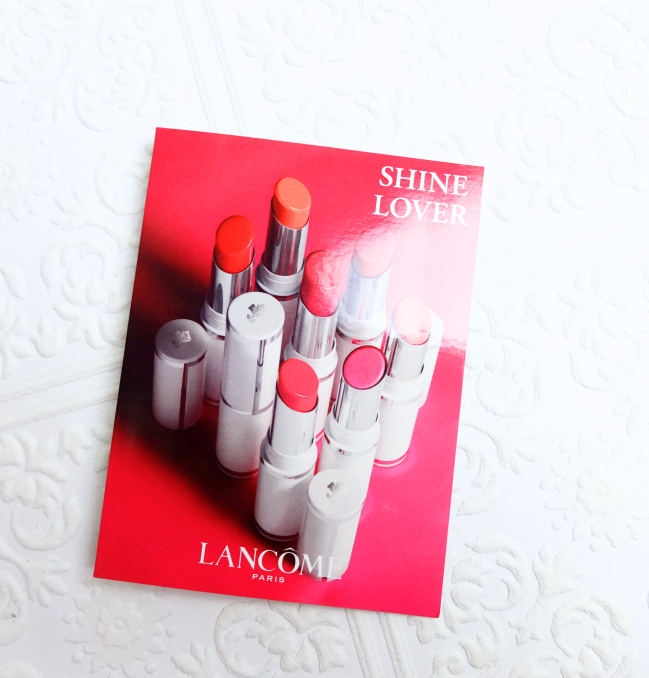 The main virtue of Lancome makeup is the price in my view. It is quite affordably priced although the skincare price is rather high. This price difference and what we have available or not in the U.S. and Canada is ridiculous! OOO Fuchsia in Paris is stunning! I swatched one a while ago and it's interesting in a way that it's translucent, the texture really clings onto the skin, and the pigment actually stays! In a way it kinda reminds me of MAC Huggable, which also wears very close to the lips if that makes sense. Wow to Fuchsia In Paris, I definitely need it. I love your lipswatches, they may make me buy everything you show! Inattendue is so pretty! I might want to get that shade, or French Soirire , or both! LOL. Too bad they're not really moisturizing..
good that I read your post as I totally forgot about the sample I got and now you got me want to try them. 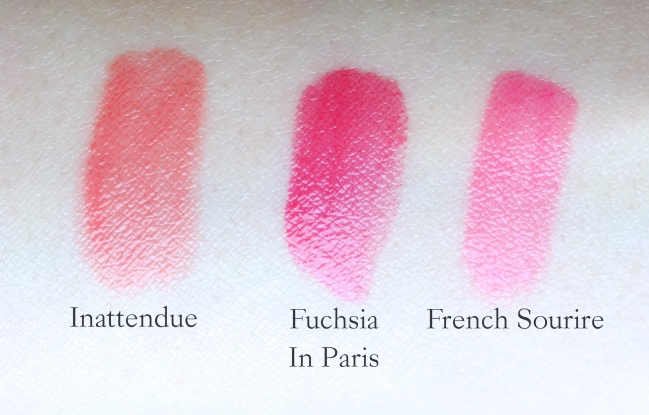 Inattendue is so pretty.I love sheer lipsticks and if these are a bit moisturizing, it would be perfect. I love that they included a tiny brush with the samples! 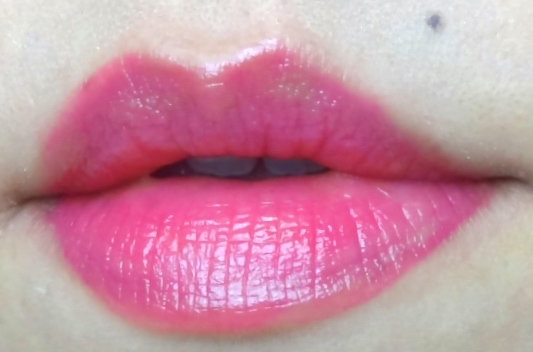 I only have one Dior Addict sheer lipstick, but I wasn't a fan. Still, these colors are so pretty, I might give sheer lipsticks a try again! So cool, I've never seen a lip sample kit like that. Based on the colour in the sample pack, I thought French Sourire would be for me, but goodness is Fuchsia In Paris ever beautiful! All of them look good on you, Lena. I think it's due to the shape of your lips, not the lipstick itself. LOL LOL! 8 hours! Bless their hearts! That's just crazy talk for a sheer lipstick formula, but I'm glad they're hydrating. I love sheers. They can do no wrong in my book. French Sourire is a BEAUT! I think this is a nice range and worth looking at IF you fall in love with a colour. I'm happy with my one fuchsia and think the shades you showed here are all quite nice. But yeah, nothing groundbreaking or anything! I'm interested in these partly because Lisa Eldridge came up with these. I really like the first shade. But at the end of the day, it's another sheer lipstick I don't really need. That explains! Because the colors are really nicely done in the range.